Though the sky remains overcast, the clouds broke long enough in the pre-dawn minutes to let me see the setting of the nearly-full moon behind the western mountains. The actual moonset was far prettier than my attempt to photograph it. And even as I was setting up the camera, I suspected that would be the case. The morning was still quite dark, and I kept hoping the moonset would hold on another minute or two so the light would have time to improve, if ever so slightly. That didn’t happen. But as I was standing outside on my back deck, an interesting non-photographic event unfolded. It started when I heard one of the foxes barking. The fox was close, just up the mountain from my cabin. Fox barks aren’t very loud—they sound a bit like a dog with laryngitis—more effort than vocalization. I’ve been told that foxes bark to communicate with their mates. The mate may be watching the kids in the den or hunting on her own, and the barks are simply a way of saying, “I’ve over here.” The second fox usually replies to report its own position. Perhaps the hunting fox needs the call to find the den again. Perhaps it’s just a “honey, I’m on my way home” announcement, minus the cell phone. In any event, this morning I never heard a second fox. After the first few barks, I could tell the fox was getting closer and eventually I knew it couldn’t be more than about 30 yards or so up the hill from my cabin. I stood stock still, scanning the too-dark woods, hoping to catch a glimpse. The fox kept barking but didn’t get any closer. Then several seconds went by without more barking, and several more seconds. And then from near where I expected to see the fox, I saw a dark blob coming down one of the taller oak trees on the hill. Now, red fox aren’t supposed to climb trees and besides, this tall tree went straight up for some feet before branching. But something was coming down that tree. 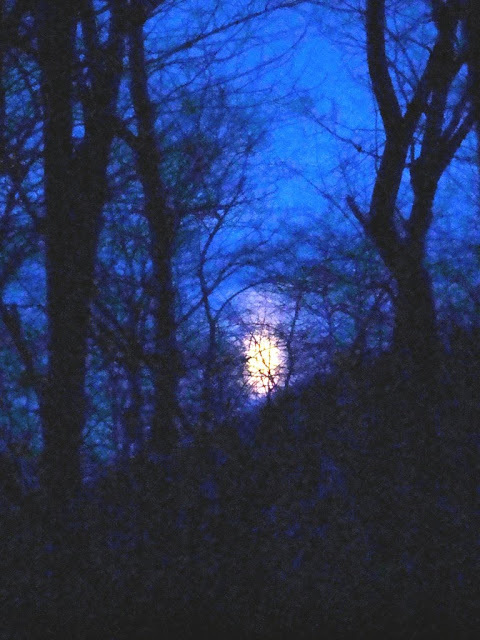 By now, the moon had set, but the soon-to-be sunrise was brightening the sky from dead black to charcoal. And then I realized what was coming down the tree. It was a raccoon. Likely it was the same one that Baby Dog saw in the bird feeder at 3:14 a.m. (I checked), prompting her howl of outrage, followed by her immediate removal from a place where she could see said raccoon to one where she could not and I could go back to sleep. Fox and raccoons frequently share the same territory, and they also avoid each other when possible. I think raccoon scurried up the tree to avoid the fox, and perhaps the fox left its barking spot because of the raccoon as well. But one thing I was sure of—when the raccoon came down the tree, the fox was gone for this night. Weather and birds are funny and don’t always do what you might expect. 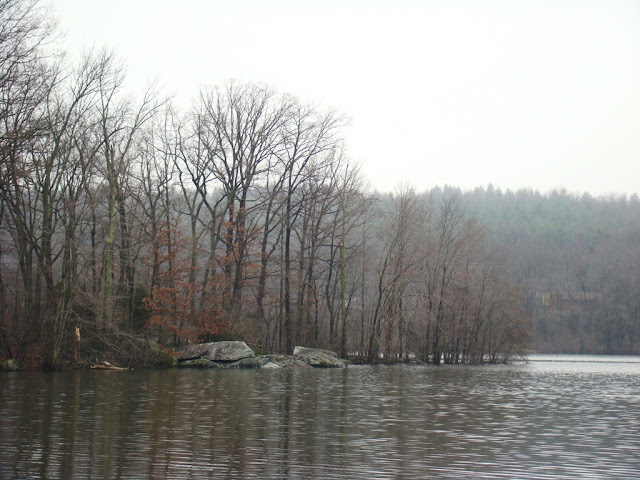 After a balmy week, the temperature on Saturday morning was a chilly 20 degrees and the day was overcast and gloomy. Sunday proved to be a bit warmer but was still as gloomy, so my expectations for a Sunday morning birding run were not high. But the time of year is right, despite questionable weather, and I added 7 species to my 2010 list—blue-winged teal, great egret, double-crested cormorant, pied-billed grebe, tree swallows, rough-winged swallows and the first butterbutts of the season. Butterbutts are a birder’s slang term for yellow-rumped warblers, which are usually the first warbler to appear in the spring. In this area of the hemisphere, they are the Myrtle race or subspecies of yellow-rumpeds. For some time, the two were thought to be a separate species, but not all that many years ago they were lumped in with the western birds and are, for the moment at least, considered a single species. Mud and rain are still the dominant barriers to deep woods forays and better photographs around my cabin. I did manage to get my car into and out of a muddy two-lane access road on Sunday morning, but I was a bit lucky on the getting out part. This morning the fog was so dense that I couldn’t see where I was walking, with or without my headlamp. Dog uncharacteristically hung back, too. I don’t think he could see any better. We are both hoping for improving weather, though we aren’t likely to see any before late on Tuesday. 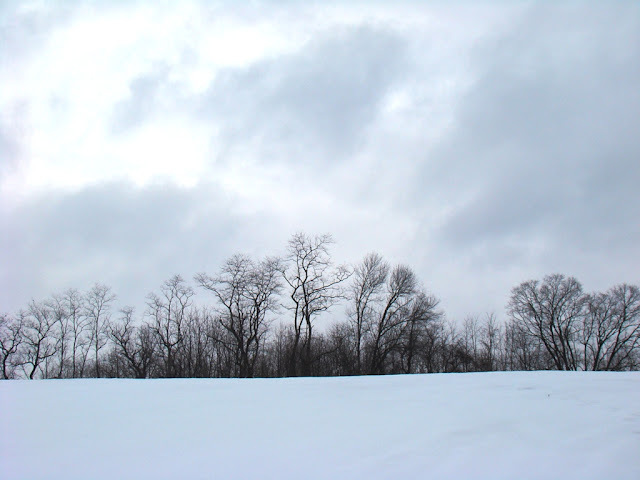 Spring is taking a pause at Roundtop this week. I’m not surprised, perhaps I’m even a bit relieved. Sustained warm weather in March, however much I appreciated a few days of it, simply isn’t normal. This past February was the snowiest on record in this area, and that was followed by what is shaping up to be the fifth warmest March ever. No wonder the change was so noticeable, and no wonder spring is taking a breather. The pace of migration has slowed, too. 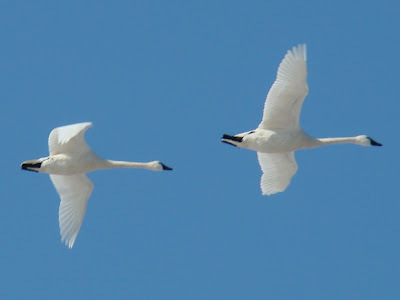 Now that the snow geese and tundra swans, who are always desperate to reach their northern breeding grounds, are though, it will probably be a while before much else arrives. I do expect the towhees before long, but the insect-eating birds are probably the better part of a month away from reaching my cabin. Last evening I was out peering at the tiny shoots of green that are starting to appear on the forest floor. At this stage—barely visible—I can’t identify much. So perhaps that’s why I didn’t notice the commotion around me until I was forced to. Suddenly, one of my chickens darted by me, a worm in her mouth, followed by 3 or 4 of the rest of the flock in hot pursuit. One had found the worm, which must be like lobster to chickens, and the others were hell-bent on stealing it from her. They raced around, soon squawking and flying. It looked like football or rugby or some very serious contact sport, but eventually the finder of the worm beat out her pursuers and gobbled the delicacy herself. Maybe I’ll get back to trying to identify plants tonight—or maybe I’ll just let the chickens out again. Spring is such fun! I wander around the forest, poking my nose here and there looking for whatever I can see, watching the morning to evening progress of the growing dog-toothed violet leaves. It’s a treat to be outside without four layers of clothing, to see daylight after my evening meal, to sit outside on the deck and watch the sun set. You’d think I’d be used to this by now. I’ve seen more than half a century’s worth of springs, but sometimes I think I enjoy them more with each passing year. Spring doesn’t seem “old hat” to me, that’s for sure. This spring almost appeared out of nowhere. Ten days ago winter’s grip was still tight, with more than a foot of snow on the ground. Perhaps it’s the sudden change of seasons this year that makes this spring seem extra sweet. Most years spring arrives more slowly. Sometimes the transition from winter to spring takes only baby steps or takes as many steps backwards as it makes forward for weeks on end. Not this year. Last evening, I heard several rumbles of thunder and even that seemed novel. The rumbles didn’t turn into a storm. Still, everywhere I turn it’s something new again. And that’s what makes spring so much fun! After a cold and snowy winter, I certainly couldn’t have imagined that the snow would be gone by mid-March nor could I have predicted several days with temperatures nearing 70. But that’s what happened, and though a storm will soon bring the warm weather to an end, I certainly appreciated this spate of glorious weather, however brief. Signs of spring are appearing daily around the cabin. The multi-colored leaves of the trout lily (aka dog-toothed violet or yellow violet) are pushing their way up through the decaying leaves. Yesterday three golden-crowned kinglets flitted through my back forest. The eastern phoebe that arrived last week has settled in, tame enough to land near me when I sit outside. I haven’t yet found any coltsfoot, the yellow dandelion-look-alike flower that appears even before its leaves. That seems a bit odd but that’s spring. The season arrives in fits and starts and each year is a bit different. Certain things are similar, but nothing is ever the same with a season. I haven’t heard any towhees yet, which is also a bit odd, nor have I found any tree swallows either. Those will come, I’m sure. 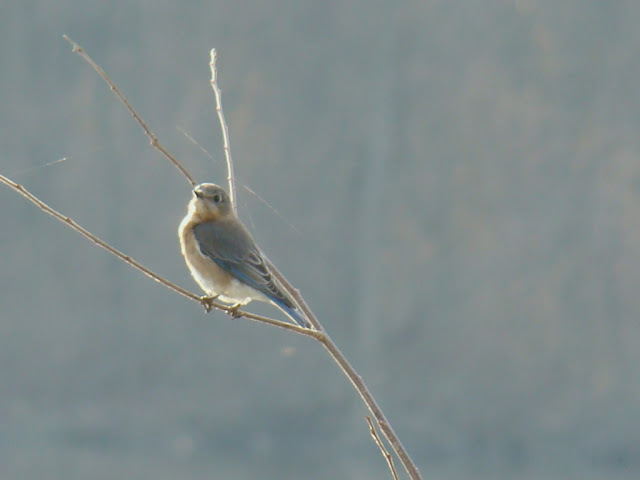 My photo today is a female bluebird. The bluebirds are active again and right now they are more common than robins in my area. 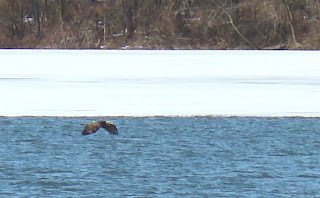 This one was with her more brightly colored mate as the two worked their way around the edge of Pinchot lake. When the early morning sun peeked through the trees and reached her perch, I thought she was every bit as pretty with her more delicate shades. The forest is still too wet and soggy to do much walking through it. Just when I think the footing will be okay, I sink in mud. For the moment, I am staying to areas I’ve already found to be solid ground underneath, though each day I can venture a bit further. Despite three days of 60 degree weather, I have yet to find any signs of new growth around the cabin. Not even coltsfoot, that dandelion look-alike, has yet made an appearance. Maybe today, maybe tomorrow. That event can’t be far off. The first phoebe appears to be settling in at the cabin, its haunting call carries through the woods late in the evening and early in the morning. The last note lingers like a sweet perfume, hanging in the air. I know towhees can’t be far behind, nor the blue-gray gnatcatchers nor the kinglets. The first spring arrivals appear slowly, one after the other, but before long the arrivals come in pairs or groups and are soon almost too many to count. Those days aren’t here yet, and the woods still feels calm and quiet. The hectic pace of May is fun, but I enjoy the quiet of these days, too. I sit on the deck and little happens to catch my eye or distract me. The woods are still and silent, the air calm. The days are warm, but the evenings turn chilly quickly. 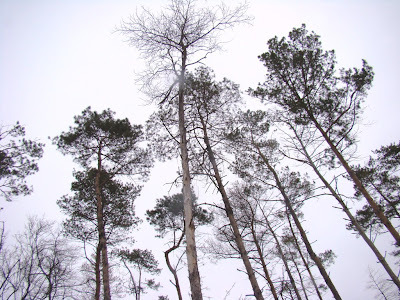 Perhaps a Red-tailed Hawk will soar over the treetops before it is too dark to see. Perhaps not. The quiet alone is enjoyment enough. Last night I heard the whistle of a flock of tundra swans heading north in a moonless sky over Roundtop. Their direction followed the north star as surely as if they were tied to it. This morning, the first eastern phoebe called from somewhere within the tangle of my side forest. One season ends, another begins. Since the rain cleared, the days have been warm, the skies clear and bird migration is exploding. Hawkwatches report the first decent migration days of the season. Songbirds arrive, too. Many just pass through on their way to somewhere else, but all are on the wing now. The wind is calm and the weather is ideal for moving north. On the ground, the earth has unfrozen and is loosening up, but I have yet to discover any sign of new green anything. A couple of spots seem promising. The small bits of grass on roadbanks or along edges no longer look withered or fully brown. But when I inspect them up close, I don’t seen signs of new growth, either. That can’t be far away, but I can’t see it just yet. A few moths flutter outside my windows, though I can’t tell you which kinds. They are difficult enough to identify without seeing them only from the underside. Spring peepers are going full throttle down off the mountain. Up where I live, they still seem to be warming up and haven’t yet begun the big performance. Seasons change in little steps, one thing at a time. The juncos are still here and some will remain for at least another month. They disappear slowly, or so it seems to me. By mid-April I will still have a few, though I might not see them every day. And then one day of not seeing them will stretch into three or five, and they will be gone again. One season ends, another begins. Tomorrow will be the day. Tomorrow will be sunny and warm, and a few hours of that will be all that’s needed for the first “new green” something to appear. Yesterday the rain finally stopped, except for an evening shower that I ignored. 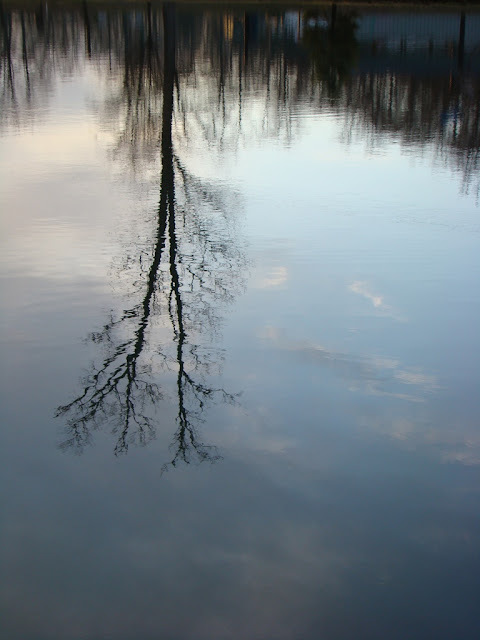 Still, the gloomy overcast remained all day, dark enough so that the entire afternoon seemed like a long twilight. 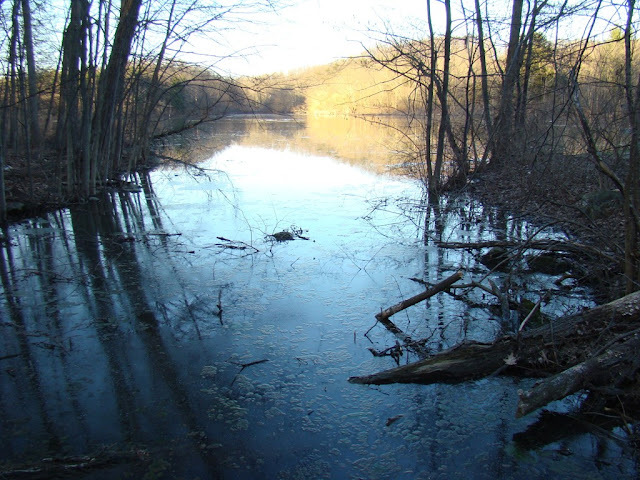 Last evening I wandered around the cabin, hoping to find something that was “new green.” It didn’t happen. I carefully examined the patches of moss but even the moss has the look of something that’s been through a rough spell. Being covered by four feet of snow can do that, even to the best moss. 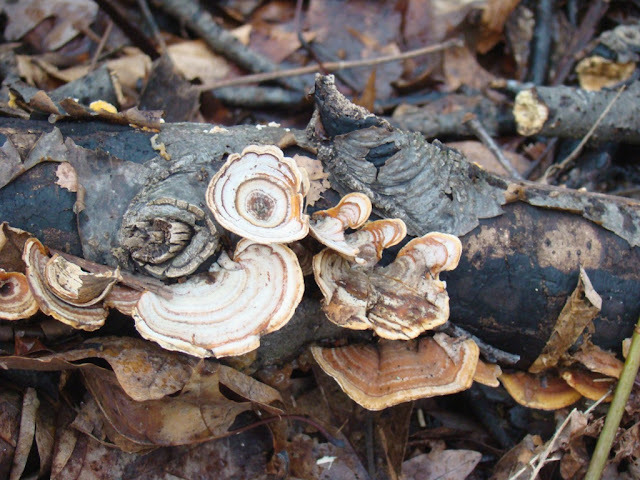 It is still soggy here and still squishy, though I don’t seem to be slurping when I walk in the woods anymore. I’m calling that progress. I half-expected to hear a phoebe this morning but that didn’t happen either. The time is right, and a full day of sunshine to fly north might be enough to bring them. I think tomorrow will be the day for that, too. The only thing soggier than the forest around me right now would be quicksand. Without the Wellies, I couldn’t get around at all. Even with Wellies, it’s not a lot of fun. I squish and slurp through the decaying leaves, sometimes sinking in mud up to my shins, though still protected by the Wellies. Maybe I’m imagining it, but I don’t think the animals much like it either. This morning, the group of 7 deer that tiptoed across my back forest just before this rain started watched Dog and me from the safety of a small hillock. They wouldn’t move off their high ground, even when we got closer than I expected to get. A rabbit huddled under a bush and wouldn’t move, even as we walked by. Dog pretended not to notice. I haven’t had phone service since the rain began, though I can’t say that I’ve missed it too much. I lost power for a while too, but this time of year that wasn’t bad for a few hours. The streams and low spots are all flooded. My plan is to stay hunkered down until the mud clears past the point of sogginess. This weather is nothing a dozen cups of tea and a warm blanket won’t cure. And once the storm is finally over, whenever that is, spring will be here in earnest. I wouldn’t be surprised if spring exploded all at once like fireworks. I am ready for that. My photo today was taken at Pinchot lake during a momentary break in the rain. It was the brightest moment of the weekend, and as you can see, it still wasn’t bright. I know video files are huge, and I apologize ahead of time to my fellow dial-up users. So with that in mind, I've kept this video clip very short. Still, if you'd like to hear and see a few seconds of tens of thousands of snow geese, here you go. Enjoy! Last night I could smell the rain that is to come. Four days of it are predicted. Flocks of Canada geese were moving, honking and honking and honking as they headed north. They were the last thing I saw and heard before I went to bed and nearly the first again when I got up this morning. The geese know that rain is coming, I am sure, so they are moving to try and get ahead of the storm or at least to get in one more full day of flight before the rains begin. This week’s temperatures have decimated the snow. Even here on the mountain I am down to some extended patches of it, but patches nonetheless. At dusk last evening, Baby Dog set up such a cry that I thought the cabin must surely be under attack by wolves. Instead, I saw 7 deer, delicately wending their way around the patches. They were led by a doe, and following behind her in single file were smaller deer and two more doe. They weren’t skin and bones but they were thin, the smaller deer almost tiny, no doubt fawns from last season. The lead doe tiptoed carefully, as though through a mine field, as she stepped carefully through my back forest. I think she was leading them out of their winter yard and towards someplace with some fresher grazing. This past weekend, in addition to my trip to Middle Creek, I found some interesting migrants at Pinchot lake. 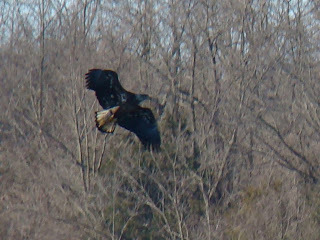 I found two young bad eagles were harassing the waterfowl. I never did decide if the eagles were serious but inept in their swoops on the geese and ducks or if chasing them was simply youthful hijinks on a beautiful day. In any event, the ducks did not appear to be in serious jeopardy but the eagles sure got them moving around and quacking. 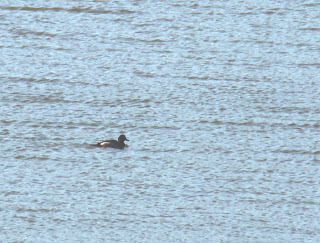 My second not so great photo today is of a duck I am calling a female greater scaup because of its nicely rounded head. Although lesser scaup are the more common species inland, they have kind of a pointed head or at least a bump on the back. This one doesn’t, so I’m calling her a greater scaup. Feel free to disagree. Waterfowl migration is underway! Snow geese are amassing at Lancaster County’s Middle Creek Wildlife Management Area, as are tundra swans. I managed a too-short trip to Middle Creek on Sunday morning and guess that well over 50,000 snow geese are currently on the site. For me, this kind of waterfowl migration is one of the wonders of this world. I think there are more than the traditional 7, but I would still rank this in the top 2 or 3. The sound that so many geese make is deafening, so it’s a good thing they aren’t always calling. But when they do start calling, I know another flock is coming in to join the thousands already there. The geese can hear their fellows before I can, but it usually doesn’t take longer than 30 seconds or so before I can hear and see the new arrivals coming, too. This year, the ice and snow cover have delayed this migration spectacle. In an average year, the geese and swans are moving north around the end of February. A weekend ago, only about 2500 geese were at the site. Yesterday it was roughly 50,000. Tomorrow it may well be 100,000. Because the arrival is later this year, I don’t think it will be spread out over as many days as usual, but that will mean more geese at once at Middle Creek. The photo shows only a very small portion of the geese. But even if I'd had a wide-angle lens, it wouldn't begin to capture the whole span of snow geese. In a normal year, this upcoming weekend would be spectacular, too. This year I am not sure of that, and the forecast for rainy weather ahead may also play a part. But if you can make the trip, either this year or in some future year, don’t miss it. Once you’ve seen it, you’ll want to come back every year to see it again. I’ve been coming for more than 20 years now, and I never get tired of this amazing spectacle. This morning when I took this photo, the sky was overcast and the sun was just starting to peek between the trees and rise above the horizon. The first blush of the day’s colors begins to tint the clouds. Few birds were yet stirring, and despite the time of year, the landscape still looks wintry and cold. 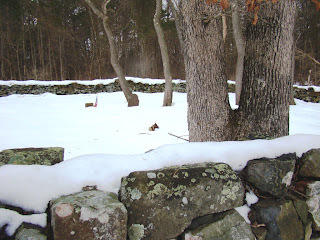 It was a surprise, then, when I first heard and then saw the season’s first killdeer, screaming and circling over the stone parking lot, which is bare of snow only because it has been plowed. March 5 is by no means my earliest record for killdeer. I’ve had them as early as the second week of February. But those sightings were not in years when I had the kind of snow cover you see in today’s photo. Killdeer are frequently spotted through much of the winter in the southern part of my county or sometimes along the edge of the county where the Susquehanna River runs. Pennsylvania sits in what the range maps consider the summer-breeding range for the species. I am on the southern edge of that range, though, with everything to the south considered the year-round range for killdeer. As York County, where I live, is also along the southern border of Pennsylvania, it’s no surprise that killdeer can sometimes be found here throughout a mild winter. Killdeer don’t read fieldguides, of course, so they don’t pay much attention to range maps. Still, finding a killdeer in January would be a good bird and worthy of note then, if not in any other month. 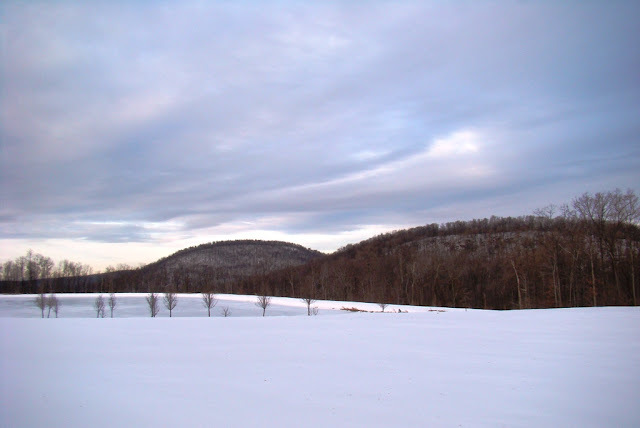 And, Roundtop Mountain isn’t along the Susquehanna or one of the large lakes in the southern part of the county where such a sighting might be possible. The mountain hasn’t ever qualified as a good winter habitat for killdeer, even if you might find them nearby elsewhere. Even so, none of the birders I know would consider killdeer to be a harbinger of spring, but I think today I will. Happy Friday. This week I’ve discovered the feeder birds that only last week spent every daylight moment haunting my deck are disappearing. This likely means they are finding their own food again, which is good for them if not for my enjoyment of watching them. I’m sure they will return should bad weather appear on the horizon, but I’m a little surprised this is happening already. 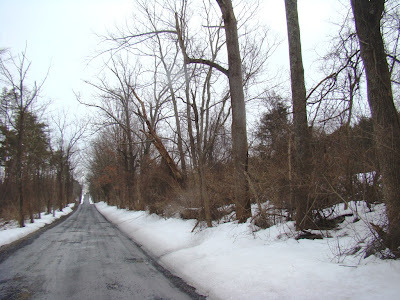 After all, I still have quite a bit of snow, though the roads and the road edges are bare. Where I once had 30 juncos, I now see but 5 or 6 in a morning. Perhaps the cardinals will show up, perhaps not. The blue jays seem undeterred, but I haven’t seen the Carolina wrens all week. This decrease in the number of birds happens every year. Some people say that never happens where they live, but it happens at my cabin every year. Perhaps it is because natural food is so readily available once they can find open ground that they simply don’t need a feeder after the winter breaks. I miss them when they aren’t congregating on my deck for breakfast. I still find them in the woods, of course, but it’s not the same as having them just over my shoulder for most of the day. For a few years, I tried to keep my feeders open all year, but the seed molds once the weather gets hot. I’ve never been able to entice orioles or the like with fruit, either. Apparently, they don’t need my offerings in summer. Later on, still several weeks away, I will take the feeders down entirely. Occasionally in the warmer seasons, a titmouse or a chickadee will show up on the deck, not so much looking for food as it appears to be checking to see if the equipment is still there, perhaps wanting to assure itself that come winter, the feeders will be back where they belong. Wildlife around the cabin seems to be picking up, if still very slightly. Last evening I saw several deer stepping carefully through the snow, avoiding the deepest spots. This morning a rabbit bounced in front of Dog and me on our morning walk. It’s just a little change, but a welcome one from the blanket of calm white that covers the forest and the fields. They were among the first signs that winter’s long slumber is soon ending or at least easing. The days of deep sleep are over, though it is too early to get up and get going. The deer are out of their winter holdings, no longer confined to one small space. The rabbits can move more or less freely again. The bluebirds are singing again. The cardinals have sung all winter—nothing seems to slow them down too much. Their songs are more sustained, though, perhaps even more urgent. 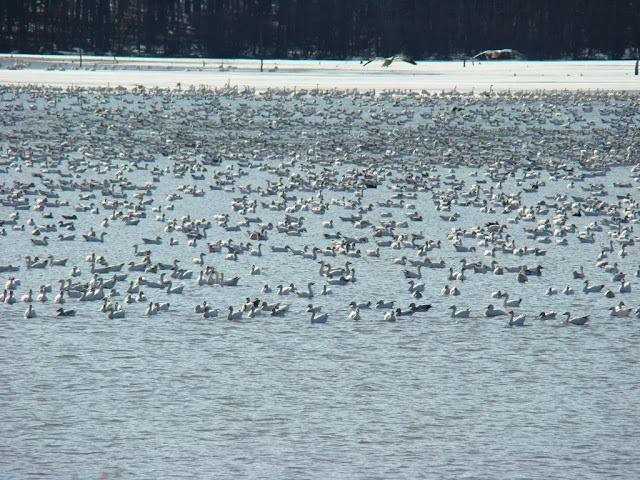 It is still too soon for thousands of snow geese to head north, but that grows closer too. Perhaps this weekend, certainly by the next, the ice will be open enough for them to race north as far as open water permits. They will cover the fields and the lakes and skies for a day or a few days. When that happens, whatever the date, spring will have arrived. The weather right now suits me perfectly. The days warm to near 40. The nights are only several degrees below freezing. Snow showers fall nearly every day. The frigid, blustery nights of midwinter have eased. 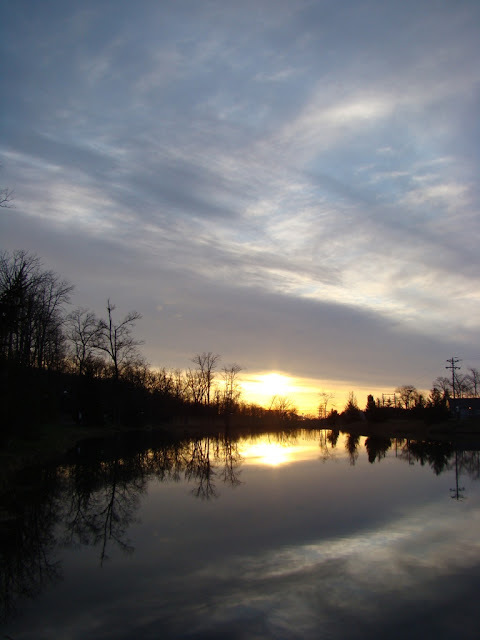 Daylight lasts, if weakly, into the evening again. I love this. I’d be happy to have a month of weather like this. This morning I heard a pair of great horned owls calling way down at the bottom of the mountain. They were so far away that I had to stop and listen and hope they would call again for me to be sure I heard them. This is the first I’ve heard them this year. I’m sure that hearing them now is a function of how the morning sky is paling at the time I always walk the dogs. They have likely always called when the stars are beginning to disappear and the eastern sky is just turning from black to charcoal, but it is only now that event corresponds to my own morning walks. The weather certainly isn’t spring-like, but it feels as though the worst of winter has passed. The days grow a bit warmer, the days lengthen. I feel as though I’ve gotten through the worst of it for this season, so now I can enjoy what’s left of the winter. February 2010 is now officially the snowiest February on record in my area. With 42 “official” inches in the bucket for the month, snowfall for the winter is already well above average. Some of last week’s snow has melted, but when I stepped off a road and into the snow this weekend, it still reached my knees. The snowcover and colder than average temperatures are affecting the return of migrating waterfowl, too. The last week of February is usually prime time to see tens of thousands of snow geese, Tundra swans and Canada geese, among others, at Middle Creek Wildlife Management Area in Lancaster County. This year, not yet. Ice still covers all ponds and lakes. I made a short trip to Pinchot State Park this weekend and found minimal open water, inhabited by exactly 6 mallards and 4 ring-billed gulls standing on the ice. Four common mergansers flew over and circled but decided they weren’t going to try a landing in the circus rink-sized puddle of open water on the lake. 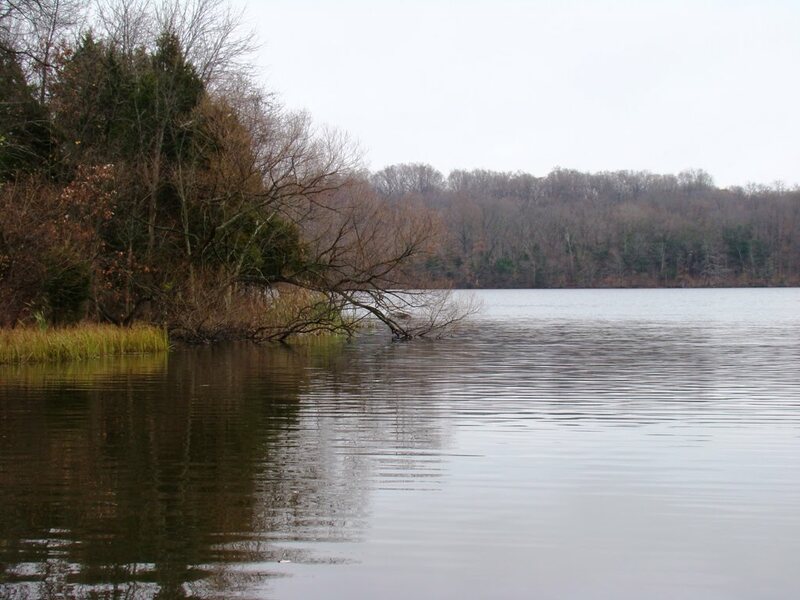 Next weekend should see an improvement in the numbers of waterfowl and the amount of open water, as the temperature will at least touch the 40-degree mark during most days this week I hope so, as I am longing for something a little different to look at or do in the woods around the cabin. My photos today are of an old cemetery near the lake. The veterans buried here are from the Revolution or the War of 1812. The red headstones are typical of that time period, though the dates are getting ever harder to read. 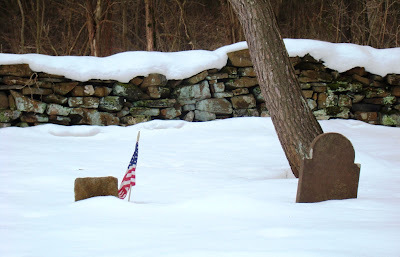 No was buried here after 1850, as I recall, though snow still kept me from going inside the stone walls to check for sure.